The pro freeskier first fell in love with the lift-accessed extremes of Engelberg in 2002, and has returned from his home in Sweden for every winter season since. My dad was a coach for a ski club in Sweden, though he never raced himself. He’s the one who got me into skiing. 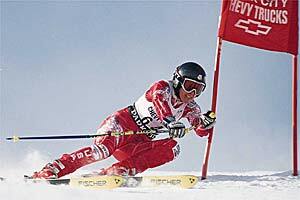 I raced until I was 19, but I wasn’t very serious about skiing back then. My father would like to think I was on my way to the World Cup, but I really wasn’t. It wasn’t just lack of talent, but laziness on my part. After leaving the ski academy, I crashed my dad’s car on a slippery road when I was out having fun. I figured he would obviously be pissed. My 20-year-old brain didn’t want to deal with it, so I took a train down to Stockholm with a friend from the academy to book a ticket to the States and leave town before my dad got home from work that day. My friend and I had been talking about trying this whole freeskiing thing. So, we just went into a travel agency and asked for a cheap ticket to the States—we didn’t know where, we just wanted to go somewhere on the west side of the country on a cheap ticket. We flew to San Francisco and bought a Volvo 240 from this shady pizza joint guy for $2,000. We toured around the West Coast, up to Whistler, to Tahoe and Snowbird for about three months. That was the first time I went freeskiing. After that trip I figured I would not be getting into a speedsuit again. This was way more fun. When I first went to Engelberg in 2002, I was just supposed to stay for a week. But Switzerland and I clicked, and I ended up staying for the season. Then I went back the next year. After a few years, I thought I should probably try another place, but the more places I saw, the more I really liked Engelberg. It’s a great place to work for professional skiers and photographers. The extremely good lift-accessed skiing, with big runs that are between 3,000 and 6,000 vertical feet, is what Engelberg is famous for. The ski touring is also amazing, but it ended up in the shadow of the lift-accessed skiing because the runs off the lift are so special in comparison to what’s at other resorts.